We’re constantly inspired by the brands we work with and the people that drive them. To share their stories and insights with other likeminded individuals, we’ve launched our interview blog series! In this series we ask some of our clients to share their stories and perspectives on what it takes for them to STAND OUT. 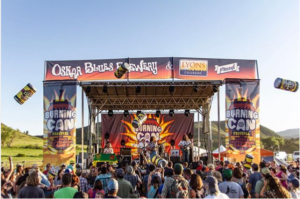 This month we sat down with Chad Melis, Marketing Director for Oskar Blues Brewery and CANarchy Craft Brewery Collective to chat about the Oskar Blues brand and how they have grown to be an innovative leader in today’s crowded craft beer market. AZ: The Oskar Blues brand is known for its fun and adventurous spirit. Established in Lyons, Colorado, with restaurants throughout the Front Range, how do you drive brand culture as you broaden your reach, and market away from home? CHAD: We’ve grown Oskar Blues as a lifestyle brand. In alignment with the vision of Dale, our founder, we’ve grown by doing the things that we love and having it resonate with beer drinkers. So we started in Lyons as a restaurant in 1997, started brewing in ’99, and then we put Dale’s Pale Ale in a can in 2002 and started distributing, which is really when this thing blew up. From then to now being in 50 states and 20 countries, we’ve been able to drive our brand culture in a couple different ways. Firstly, we’ve created several of spin-off businesses that are authentic in different spaces to help define who we are coast to coast. 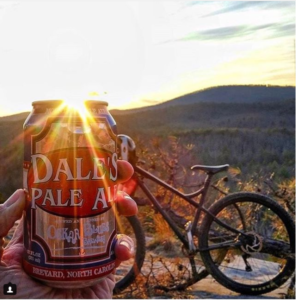 For example, we started REEB Cycles—a handmade mountain bike company—because of our passion for the outdoors and mountain biking, which is an authentic narrative that we can leverage when speaking to that outdoor beer drinker. 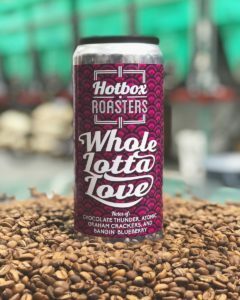 Another example is Hotbox Roasters which is a spinoff of Dale’s love for coffee and is a way we can continue to build our narrative in the food space. A second approach we’ve taken has to do with how we’ve chosen to grow. Because craft beer is such a local and community-driven concept, we’re deathly afraid of building a big beer factory and forgetting that grassroots, underdog mentality that we were built on just to meet our capacity demand. So in 2008, we added a Longmont facility which allowed us to grow capacity and meet demand, while continuing to be local throughout the Colorado market. Then as demand continued to grow, we opened a brewery in the hills of western North Carolina—a place that had a lot of similarities to the Longmont and Lyons areas. It had amazingly fresh water and a quality of life that revolved around our three core pillars—the outdoors, craft beer, and music. So we were able to become local in that community through our local events, partnerships and spinoff brands. And based on that model, we’ve now done the same thing in Austin, TX which also aligns with the outdoor, music, and craft beer elements of our brand. Now obviously, just opening the doors of some place doesn’t make you local—you have to put an unbelievable amount of thought and effort towards becoming a true contributor in a community and authentically being local, by making thoughtful decisions that are right for the community every single time. If you make a wrong decision, it’s amplified because you’re seen as an outsider and you have to learn and get better. AZ: History has shown that Oskar Blues is a brand that has always forged its own path. Changing the way people think of canned beer is an example of this. You raised expectations, fulfilled a need, and kept environmental burden in-check. Where are you going next? CHAD: Continued innovation is something we focus on day in and day out. It was easier collaborating when there were only 6 of us, but as we’ve grown to nearly 300 employees, we’ve really had to put a lot of effort around ensuring that we do continue to drive innovation and focus. There is no finish line on innovation, and that’s how we approach our future. And going into the future, we need to continue to focus on packaging innovation. We started with putting Dale’s Pale Ale in a can back in 2002, then worked with the Ball Corporation on 16 oz. cans and being the first to bring the 19.2 oz. “stovepipe” cans to America. 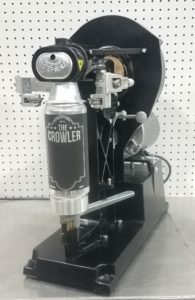 Our most recent packaging innovation is the Crowler, which is helping a lot of brewers big and small be able to fill a can to-go anywhere draft is being poured, with all the advantages of using cans over bottles (like keeping beer pressure longer, infinitely recyclable, infinitely portable, etc). And secondarily to that, a focus on liquid innovation will also be something that’s hugely important for Oskar Blues. Over the last couple years we really stayed focused on our core brands, and didn’t offer a lot of new beer while we allowed our sales team and distribution channels to strengthen. But now with 7000 breweries and so many high quality, creative beer options out there, we have to focus again on our liquid innovation to stay competitive. AZ: As Oskar Blues continues to grow and explore new ventures, what keeps you guys grounded and focused? CHAD: I think it’s our commitment to staying grassroots. The idea of being deathly afraid of building a big beer factory and becoming a faceless company and not knowing your coworker’s name. Take, for example, how we’ve chosen to grow. If we were making decisions that weren’t based on our culture and staying grounded, we would have built a brewery next to a highway somewhere. Instead, we build in the hills of North Carolina where getting raw ingredients in and getting beer out is almost impossible, but it’s in alignment with our commitment to trying to stay small and preserving our culture while still meeting the demand beer drinkers. Also, it’s helpful having companies like REEB Cycles and Hotbox Coffee that are in start-up mode. The gritty and disruptive nature of startups reminds us of how hard it is to start to get that momentum of a successful brand, and we like the challenge that it presents. It keeps us grounded. AZ: As more and more brewers enter the marketplace, what do you do at Oskar Blues to differentiate yourselves and maintain relevancy? CHAD: We built company as a lifestyle brand centered on doing what you love, and doing it full on—not half-assing it. Finding ways to accentuate those core values of our brand, like REEB Cycles and Burning Can Festival, helps us reinforce who we are. We’re selling Oskar Blues beer as a lifestyle and not just a beer. 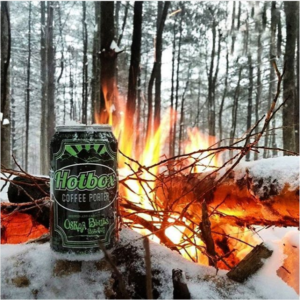 We say, “pack it in, pack it out”—that craft beer in a can is meant to be shared trail-side. We’re not trying to sell on price, or a style or label. It is a lifestyle. And that’s how we’ve tried to set ourselves apart. Now, obviously, with tons of people taking a similar approach, it’s more challenging to stand out. So you just need to be more creative and focus on innovation and continue to push yourselves and compete. Never give up, keep fighting and stay creative. AZ: Along with your dedication to innovation, you guys have always been true leaders in the industry and an inspiration to other brewers. Are there any trends that you’re watching right now that will impact your business, as well as the industry? CHAD: You can’t deny the New England Hazy IPA movement. There are 7000 breweries out there and some amazingly creative things happening in the marketplace. You can’t ignore the trends. When we were small, we didn’t look at trends at all. We did what we loved and it helped us become a leader and a trendsetter. Just putting craft beer in a can kind of put us in that spot. But now we try to stay aware of the trends and understanding what’s happening in the market. We may get excited about a new style that’s doing well because we think we can execute a beer that is unique to that space. But I think there is a conflict internally between knowing trend data and wanting to challenge yourself to pave your own path and to buck those trends. So we continue to find that balance between understanding the trends and continuing to innovate, push the boundaries, and do things differently. AZ: It sounds like it’s been a good time and you guys have created something really special out there. As marketers in general, it’s been very inspirational to see what you guys have been doing just locally here as well. CHAD: Yeah it’s been a wild ride, and as we’ve grown to 50 states and 20 countries, you guys have been a huge part of how we have represented our brand at retail and how we have presented our brewery to craft beer fans. You guys have been a great partner, and we appreciate it. And the sentiment is mutual. 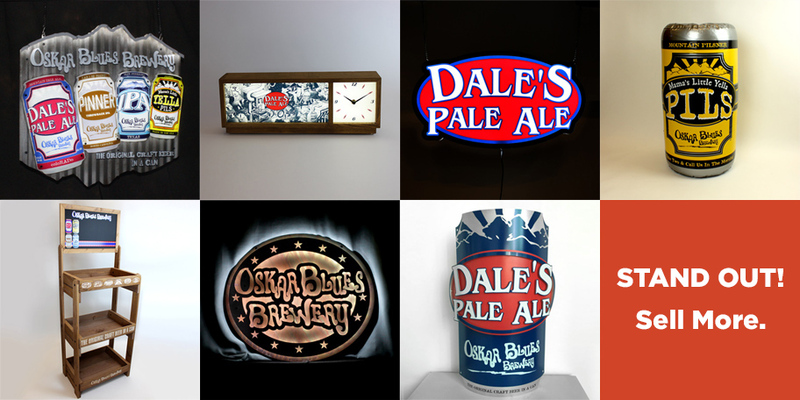 The innovative culture at Oskar Blues is contagious. Constantly being challenged to push past barriers, we have experienced many innovative and creative breakthroughs in partnering with Chad and his team. They are constantly trying to do things differently, allowing us to work outside of the box to help them Stand Out.